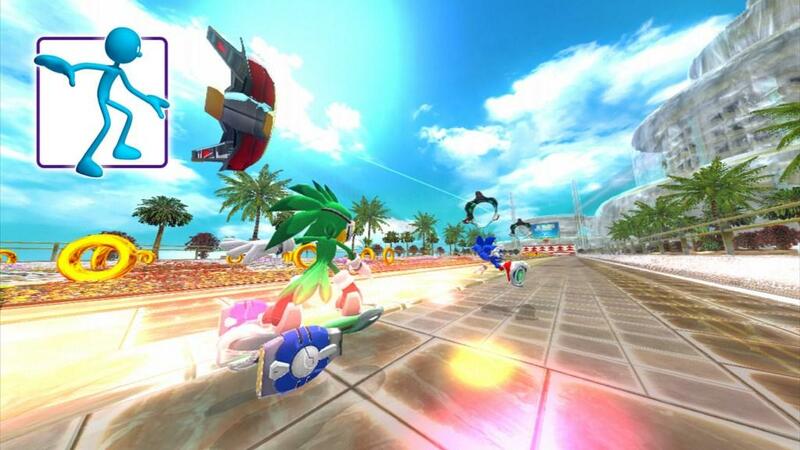 Sonic Team in conjunction with Sega has put out yet another title in the Sonic Riders franchise. The racing hoverboard game, Sonic Free Riders, has taken heights to the motion control era with Microsoft’s new Kinect technology. 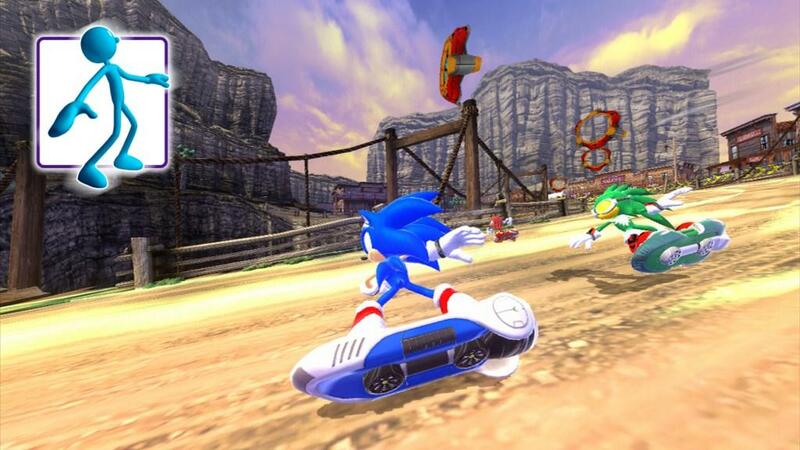 Playing as one of the many characters (such as Sonic the Hedgehog himself or Jet the Hawk) in one of four teams, players will embark on a racing competition in Dr. Eggman’s World Grand Prix race for money and treasures (although, of course, not all is as it seems with Dr. Eggman’s intentions). What sounds like the perfect game for a motion control technology ultimately results in a frustrating battle against the game’s mechanics. The very first irritable feature of the game that players will notice is the menu system. The Kinect boasts extremely natural and intuitive usability, but this is lost on some software products. Sonic Team certainly did not understand that the point was to make navigation easier, rather than make gamers want to swap discs before they’ve even started the game. Unfortunately, the menu style is incredibly indicative of the exacerbating gaming experience to come. Once you finally trudge through a mundane tutorial session, hopes reemerge (for some unaccounted for reason) that the competitive races will not replicate the same simultaneously boring and unresponsive control of your hoverboard. 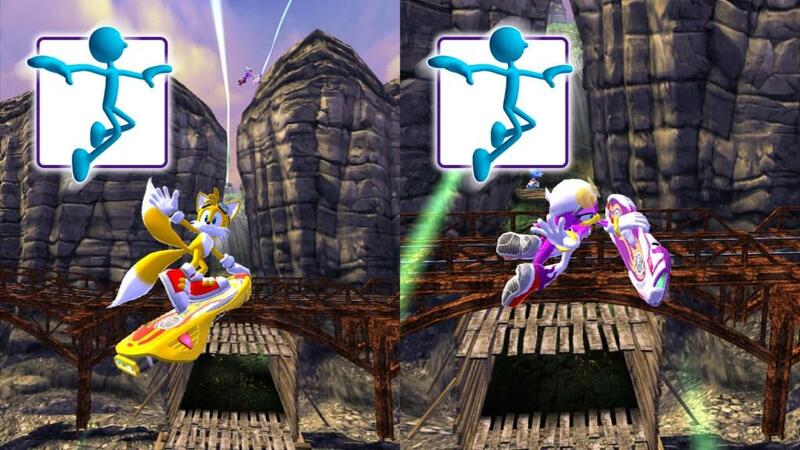 Basic control requires players to bend their knees to direct their hoverboard, perform kick motions to gain speed (like a skateboard), and jump for tricks and coins. Embarking on the World Grand Prix, I selected to play as Team Babylons first. A basic storyline is set in place and makes references to the characters and their known relationships, but I couldn’t see beyond the fact that I constantly felt like I was struggling against my character. I am allegedly in control of the character on their hoverboard, but every movement feels like a delayed and inexact reaction. 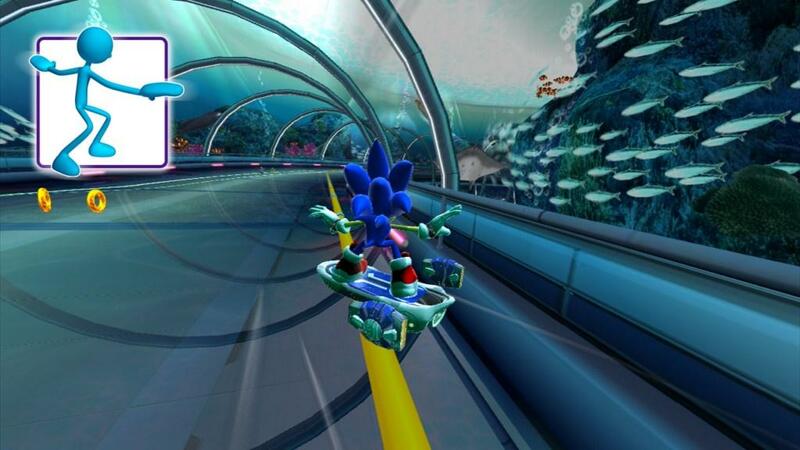 The most exciting aspect of Sonic Free Riders is the many weapons and abilities available to you that can potentially add depth to the racing experience. You can throw many weapons at players ahead of you a la Mario Kart, but progressing in the game also means that you get an opportunity to add extra gear, and therefore powerups, to your board. If you can master the restricting controls that the game demands, Sonic Free Riders would be less an irritable experience and more about tinkering with the many weapons and powerups you can equip. 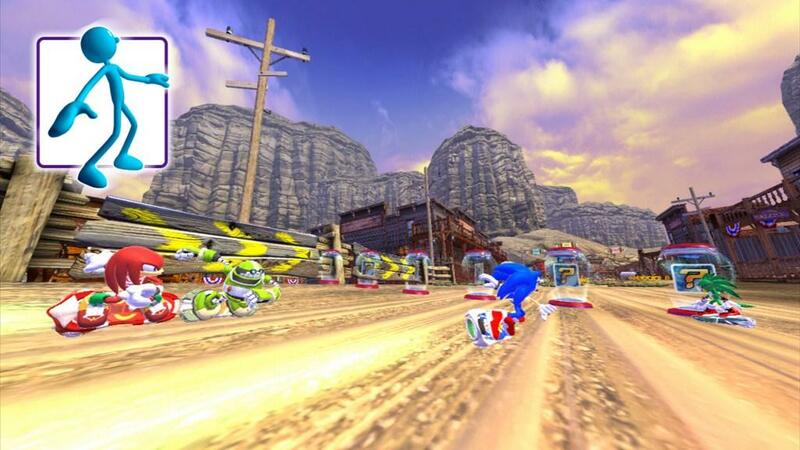 There is not much content in terms of races and storyline in Sonic Free Riders The graphics add no glamor, either. Cut scenes are washed out and boast no animation. The colors fall flat and images feel greyed out and grainy, although tracks are riddled with random pathways and platforms. If the controls were more responsive, Sega might be able to tread upon the idea of a claim to worth for their otherwise forgettable game, but the game does not hold any intrigue as it currently stands. 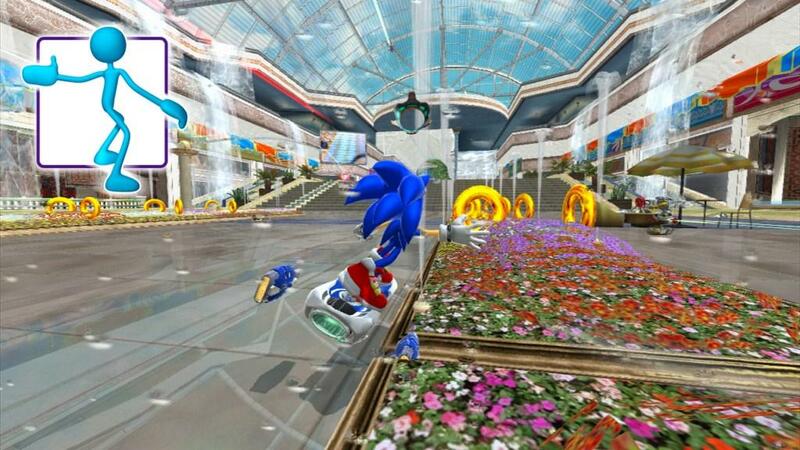 Sonic Free Riders has a lot of good ideas, but none that are brought to fruition what serves as the ultimate experience. Terribly unforgiving motion controls force the player to concentrate more on mastering the rigid controls than on experimenting with the many weapons and gear options. Rather than being allowed to explore what secrets each track has to offer, players are stuck pleasing the demands of the game mechanics. The controls drop a shadow on what could have been an entertaining experience. I am host to the kind of split-personality that is only possible when a girl is both born and raised in New York City, yet spends a lot of time with two older brothers. So, on one hand, I'm a NYU student majoring in media and communication who has a healthy obsession with fashion, music, media and the latest happenings in NYC. But, on the other hand, I'm rocking a level 70 blood elf warlock (I just got Lich King -- give me a break), spend much of my time playing games of all genres and platforms, and if you pass by my dorm you can possibly even hear my roar of victory as I spring on the unsuspecting as one of the infected in Left 4 Dead. And just when I thought things were as random as they could be, I spent the summer in Texas and, turns out, I like 4-wheeling and shooting (real) guns too. I whet my appetite early on the classics and later moved on to Counter-Strike, GoldenEye and the like. You'll find me trying just about any game now -- I even tried my hand at Cooking Mama -- but the more blood and gore, the better. All my friends and family are probably pretty annoyed by how much I talk about video games. It's your turn now, Internet.